Peter Underhill & Torch, originally uploaded by johnwmacdonald. 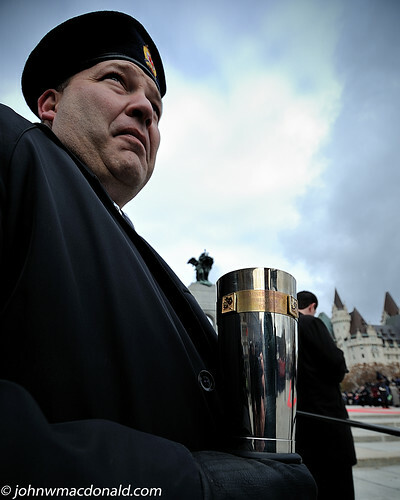 Peter Underhill holds the torch prior to the ceremony which is to be passed through various soldier's hands at the site of the Tomb of the Unknown Soldier. from CBC files: "Only one Canadian veteran from the First World War is still alive — John Babcock, 108, who was born on an Ontario farm and lives in the United States. Babcock participated in Ottawa's ceremony by video conference, "passing" a lit torch, a reference to Lt.-Col. John McCrae's famous poem, In Flanders Fields."